Malala Yousafzai’s courageous advocacy for girls’ education has inspired people across the globe, and today she was awarded the 2014 Nobel Peace Prize. As a student at the school her father ran in Pakistan’s Swat Valley, Malala became a well-known champion for educating girls. 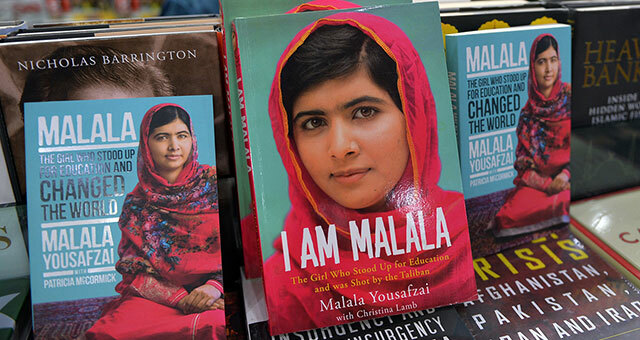 And ultimately, she also became a target for the Taliban, who violently oppose schooling for girls. A Taliban gunman shot Malala in October 2012, but today, at age 17, she has recovered from her injuries and now lives in Birmingham, England. The vast majority of Pakistanis agree with Malala, not the Taliban, on the issue of girls’ education. 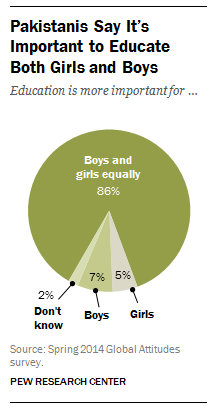 In a 2014 Pew Research Center survey, 86% said education is equally important for boys and girls. This included 85% of men and 87% of women. When we asked specifically about Malala in our 2014 poll, we found more Pakistanis expressing positive views about her (30%) than negative views (20%). However, roughly half did not have an opinion – something that could certainly change now that she’s won what is arguably the world’s most high profile honor. Overall, the Taliban has little support in Pakistan. Anti-Taliban sentiments rose sharply in 2009, when, for a time, the militant group took control in much of the Swat Valley, which is within 100 miles of the capital Islamabad. In 2008, Pakistani views about the Taliban were essentially divided: 27% gave the extremist organization a positive rating, 33% gave it a negative one, and 40% offered no opinion. A year later, seven-in-ten Pakistanis expressed an unfavorable view, and ratings for the Taliban have remained decidedly negative ever since.